I need to be honest and just put this out there: I am not familiar with the fairy tale "The Snow Queen." However, I have a book of Hans Christian Andersen fairy tales and have been meaning to read it, so it's time to get on that. 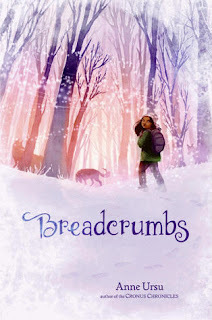 I love fairy tales and retellings, and Breadcrumbs one has an especially gorgeous cover. Definitely one I plan to pick up. The cover of this one is gorgeous! I haven't read The Snow Queen either, but I'm definitely intrigued by this book's description nonetheless. Great pick! Yes, yes, preorder it now!! Seriously, it was really, really good. Potentially one of my favorite MG reads in a long time.